With the rise in heating fuel prices, air source heat pumps have become more popular as an alternative to conventional heat sources. Currently around 8,000 to 10,000 are installed in domestic homes in the UK each year. 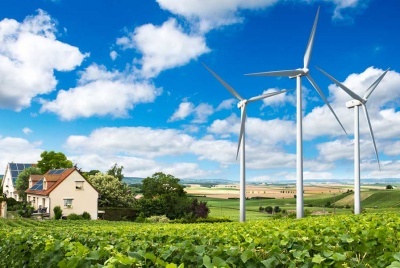 The Renewable Heat Incentive – which sees households with qualifying renewables receive payment for a period of seven years – has also helped to bolster take up. What’s more, air source heat pumps partner well with underfloor heating. However, air source heat pumps are not a ‘one-size-fits-all’ solution and arguably not suitable for every home. Here, we explain the technology, explore some of the latest options and what to consider before buying. Although an air source heat pump does physically replace a boiler as the heat source, its operational characteristics are very different and must be accommodated and understood. An air source heat pump does not create heat — it simply moves it from one place to another through the vapour compression cycle (or refrigeration process) to make it into a more useable form. They rely on electricity to power the pump. Efficiency is stated as the SCOP (Seasonal Coefficient of Performance). A typical figure for an air source heat pump might be 3.2 (i.e. 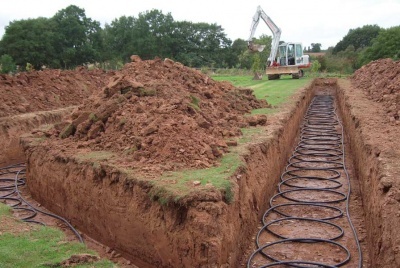 1kW of electricity creates 3.2kW of heat); the comparable ratio for ground source heat pumps is more like 4, so for every 1kW of electricity, 4kW is generated). The air source heat pump gets its energy from the surrounding air, so as the ambient temperature drops, so does the efficiency. The bigger the difference between the outside air and the target temperature (either the indoor room temperature or domestic hot water), the lower the efficiency. It is therefore key to have a good understanding of the heat load of the property and the performance characteristics of the heat pump. When it comes to space heating, air source heat pumps work best with underfloor heating, but low-flow temperature radiators will work as well. It is essential to design and specify the system correctly and ideally the insulation, airtightness and emitters (typically underfloor heating) of the property are optimised. A 4kW Earth Save air-source heat pump was installed in this energy-efficient self build home on the Isle of Man. An air source heat pump typically costs from £7,000–£11,000, including installation; expect to pay around £11,000 for a good quality system. For a four bedroom home built to Building Regulations’ standard, expect running costs of £703 per year for an air source heat pump, based on a SCOP of 3.2. A newish gas boiler, with an efficiency of 90%, will cost around £900 a year to run. The above does not take into account payments you will receive under the Renewable Heat Incentive when investing in an air source heat pump. 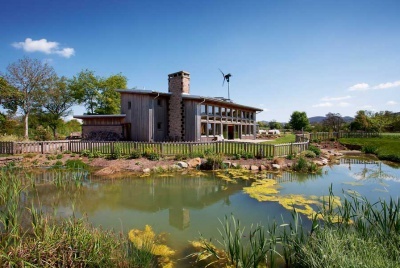 This award-winning self build home in Oxfordshire features an Ecocent hot water system and mechanical ventilation heat recovery system, as well as an air-source heat pump. Can an Air Source Heat Pump Provide Both Heating and Hot Water? One of the first decisions to make when buying an air source heat pump is whether it will provide space heating or domestic hot water — or both. Space heating will usually require a flow temperature of around 35°C to 45°C (for underfloor heating or low-temperature radiators). Domestic hot water will, however, require an absolute minimum flow temperature of 55°C. On new homes that meet recent and current Building Regulations most air source heat pumps can do both. Another solution is to use two heat pumps: one that is optimised for the space heating and another for domestic hot water. 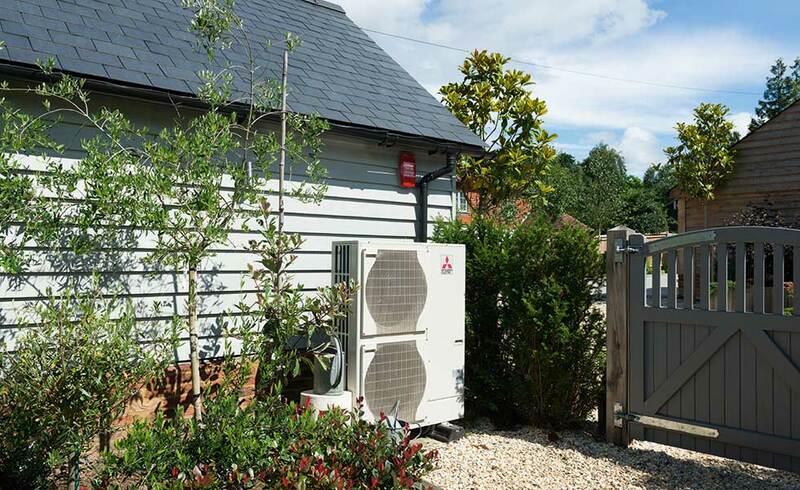 The advantages of using the two heat pumps is that each unit is specifically optimised for the required flow temperature and there is no priority system that causes the space heating circuit to ‘cool’ while the domestic hot water is being reheated. The domestic hot water heat pump typically uses a different refrigerant that can produce higher flow temperatures but conversely also requires a higher source temperature (above 4°C) to be efficient. 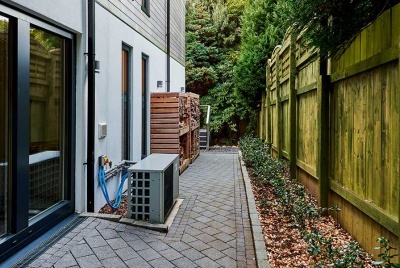 If you do not have a ducted ventilation system and don’t want to draw heat from inside the property, you could consider a different type of ‘micro’ heat pump — a thermodynamic system for instance. It is in effect an R134a air source heat pump with an outdoor panel evaporator, and if it is designed and applied correctly there is no reason why it should not work efficiently. The outdoor panel contains refrigerant and relies on ambient temperature and solar incidence as a heat source. The panel is often mounted on a roof but can be wall-mounted. Bear in mind that it needs good exposure to sunlight and moving air, so it should not be tucked away behind the garage or shed. The micro heat pump only draws about 400W (watts) of electricity, and produces around 1,500W of heat, so if you have photovoltaic panels fitted to the property, the micro heat pump will also be optimised to use the on-house generation and possibly heat your water for free. £14,000 of the total £200,000 build budget for this oak frame home in an off-mains gas area was allocated to underfloor heating and an air-source heat pump. In order to achieve higher temperatures, some manufacturers have built the two different refrigerant systems (R410a and R134a) into one heat pump in a ‘cascade’ system that can create flow temperatures of up to 80°C. These systems (such as the Daikin Altherma) are designed for hot water and should not be used as a high temperature boiler replacement unless the lower efficiency has been carefully calculated to make certain that it is the best option for the property. In the pursuit of higher temperatures and better efficiencies there are also a number of other new technological advancements that are worth noting. Compressors have been developed that effectively allow the compressed vapour to be re-injected into the compressor to enhance the temperature. These systems are capable of getting flow temperatures of around 65°C and have the ability to modulate through the inverter compressor technology. The advantage of this system is that it reduces the complexity of the heat pump and therefore the cost. The operating pressures put a larger load on the compressor and push the tolerance of the refrigerant — examples include the Dimplex A-class ASHP and Mitsubishi Electric Ecodan. Heating is rarely used in this contemporary self build in Surrey — the house, which has an EPC A rating, is heated with a Terra Therma air-source heat pump. Modern air source heat pump heating systems require specialist design and commissioning to achieve and maintain efficiency. In the age of the ‘app’ and smart heating controls, these systems can easily be tampered with, resulting in lower efficiency and high running costs. Some manufacturers have therefore developed controls that can be monitored and maintained remotely. This is especially useful in second homes and rental properties, as well as for those occupants with a healthy fear of technology, as the systems can be reset and adjusted without someone coming out to the property. In the event of a breakdown, the system can be checked, faults diagnosed and the correct spares sourced before incurring the expense of going to site. The engineering accessibility is often an after-sales add-on product, so check costs and requirements before ordering. In the absence of full remote control and monitoring it is worth trying to find a controller that stores the operating data on a memory card so that it can be accessed for analysis and perhaps new settings emailed to you for upload. A smart controller for the whole house is also an option, but these controllers will usually only monitor and store the room setting and hot water data and so will not have any information on the commissioning settings or fault codes from the air source heat pump. David is an expert in sustainable building and energy efficiency and is a director of Heat and Energy Ltd.
Tim Pullen is Homebuilding and Renovating’s expert in sustainable building and energy efficiency. He is the author of Simply Sustainable Homes.